The TP-Link Archer C5400 delivers combined Tri-Band Wi-Fi speeds up to 5334Mbps, letting you dedicate an entire band to gaming without slowing down your network. MU-MIMO technology allows the router to achieve 4X efficiency by communicating with up to four devices at once while Smart Connect automatically assigns each device to the best available band to achieve optimal performance. 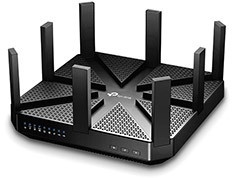 It's powered by an ultra-Fast 1.4GHz Dual-Core CPU with 3 co-processors designed to provide fast and stable overall performance while 8 external Antennas maximise the Wi-Fi coverage and enhance the wireless connections.